Three years after suing Napster, Metallica is offering songs from its new album exclusively on the Internet. The heavy metal band, whose first album in six years is scheduled for release Thursday, is making some tracks available online as well through a partnership with Speakeasy, the Seattle-based high-speed Internet access provider said. Customers who buy Metallica's new compact disc, "St. Anger," will find a code inside the packaging allowing them to view, listen to and download exclusive, unreleased music tracks from a Metallica Web site. Speakeasy will host and manage the Web site and music offerings. The company didn't disclose terms of the deal in its announcement Tuesday. 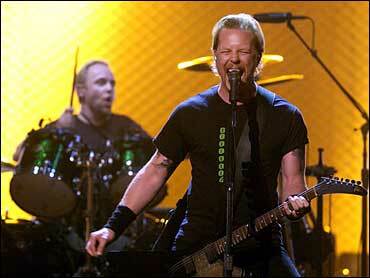 The arrangement is a show of confidence from Metallica, which in 2000 sued Napster, the now-defunct music file swapping service, alleging copyright infringement and racketeering. "We've always wanted our fans to experience our music online," drummer Lars Ulrich said. "But up until now, the existing distribution methods have not passed the kind of 'quality' standards our fans have come to expect from us."